Medal: "Mary, Refuge of Holy Love" - 5 Pack. 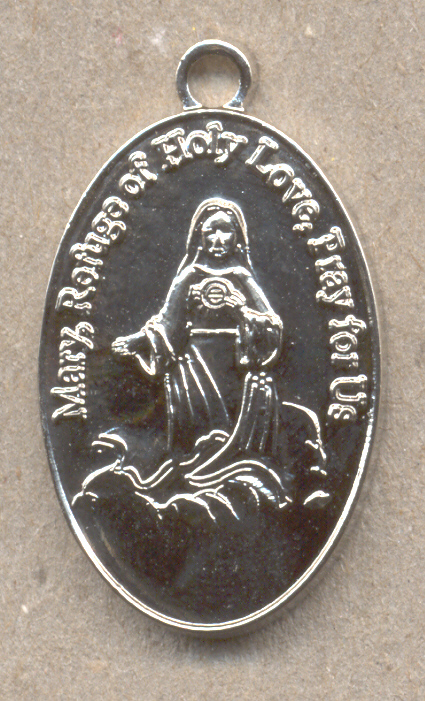 Medal: Mary, Refuge of Holy Love (Silvertone/Shiny)- 5 Pack. Oval-shaped medals of Mary under the title of Mary, Refuge of Holy Love. These medals hold the same graces as the printed image of Mary, Refuge of Holy Love including protection against evil. 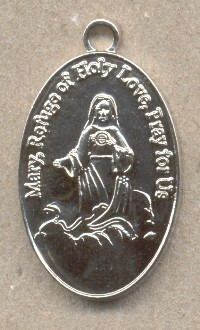 Front of medals show Mary surrounded by the words Mary, Refuge of Holy Love, Pray for Us. The reverse side depicts the image of the United Hearts of Jesus and Mary and the words United Hearts of Jesus and Mary, Come to Our Aid. Silvertone finish. Pack of 5 each. Size: .75 x 1 in.